For Spring Break this year, I did what lot of people along the Gulf Coast do. I headed to the Big Easy. I wasn’t there for the drinks or the late night shenanigans. I went for two reasons: bookstores and cemeteries. And while I am very much a fan of both, I’m going to concentrate on the city’s bookish offerings. There is much about the city that has inspired writers over the generations, including those famous graveyards, but this isn’t going to be a tour of literary landmarks, either. Instead, I’m going to show you the parts of the city that made me, as a lover of books, feel most at home. My first stop, after taking the street car to Jackson Square, was Faulkner House Books in Pirate’s Alley. This tiny bookstore is housed in the front room of the home, where Faulkner lived during 1925, when he was writing the novel “Soldier’s Pay.” The room is books from floor to ceiling, with each title hand-picked by the proprietor, with a heavy emphasis on the works of Faulkner, Tennessee Williams, and Southern Americana in general. The store gets a bit crowded at times, but it’s worth a return trip on you way back to the riverfront, to browse those amazing shelves. It is, in the estimation of many authors and collectors, as the most charming bookstore in America. Next stop, and site of my first book purchase of the trip, is Dauphine Street Books. It’s a very narrow space, not exactly ideal for browsing, but if you have any idea what you want, the shop’s owner can go straight to it on the shelf. I didn’t have an exact title in mind, but I was looking for something Latin or with a Texas connection. After a brief conversation, he went straight to a shelf, grabbed the book he wanted, and put a copy of Dagoberto Gilb’s The Magic of Blood in my hands. I couldn’t be happier with the result. Crescent City Books is a store that you can wander around in. It takes up two stories in its own historic building, and provides a nice little spot to hide from the heat and the crowds. It’s a book browser’s dream. The store is also home to the Black Widow Salon, hosted by bookseller and author Michael Allen Zell. The long-running series comes to an end on December 7, with a visit from songwriters Ratty Scurvics and John Porter. Zell is the one that I would point to as the expert on all things literary in New Orleans. He pointed me to several of the other shops that hadn’t popped up on my radar, including Librairie Book Shop, where I picked up a copy of his novel Errata. 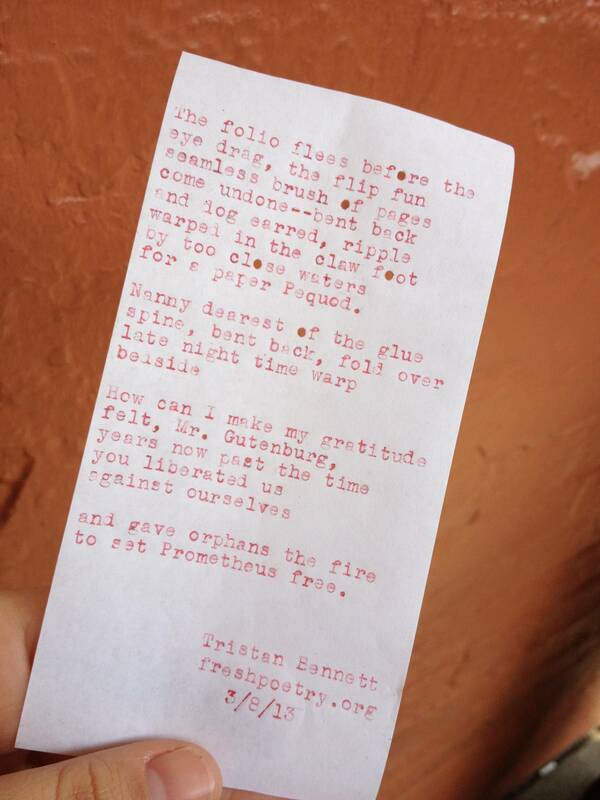 Other bookish bright spots from my stroll through the French Quarter included a poem from Tristan Bennett, a poetry busker/performance artist working with a typewriter and carbon paper. The deal is that he’ll write a poem about most anything. For $10, I got one about books (which you can read more clearly here). Tristan is often found on Frenchman’s Street, especially on the weekends. Look him up, and let him write a poem for you, too. I kept that poem out on the table while I had a drink at Backspace Bar, a place where books and tools of the writing trade are on display and every item on the menu was inspired by an author or his/her work. I followed that with browsing the cookbook collection at Kitchen Witch Cookbooks. Down the block was a very cool shop with kitchen accessories, where I snagged a copy of Dinner with Tenneessee Williams: Recipes and Stories Inspired by America’s Southern Playwright. This bookshop is located in a sleepier part of the city. It’s a larger shop, and it carries a wide range of both used books and new releases. There’s also an impressive rare book collection. The shop plays host to a wide range of authors visiting the city, and they makes a special effort to promote regional authors, too. After a very persuasive handsell, I left the store with a copy of The Mapmaker’s War by Ronlyn Domingue. There are lots of other bookish sites and sounds to be found in New Orleans. I think my most perfect bookish moment came when I found a good bench to sit on near Jackson Square, and I sat reading the first few pages of one of my recently acquired books. Street musicians in the background, artists all around. It’s the perfect place to do a little public reading. If you’re planning a visit, and you want the full literary experience, I suggest attending the Tennessee Williams / New Orleans Literary Festival, March 19-23, 2014. You’ll get a full dose of all that the city has to offer the book lovers who find their way there.